Build memories with family and friends in a stylish and relaxing outdoor living space. Decks, patios, covered porches and pergolas can all be designed to fit your home and budget. We work to make outdoor spaces an extension of your current living space to maximize use and enjoyment. Our team provides full service landscape design and plant installation to deliver a turnkey product that is personalized to your needs. We pride ourselves in transforming your property with professional design that takes into account aesthetics and durability. 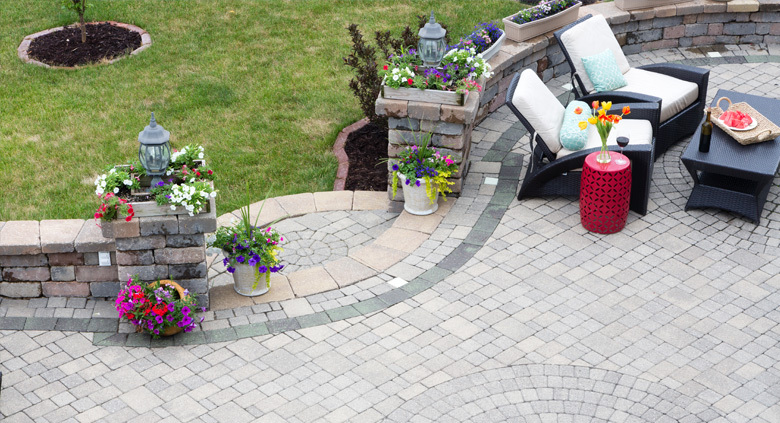 Paver patios, walkways, retaining walls and decorative stairways can be incorporated into your home’s appearance to enhance exterior style and improve function around your home. We use a variety of stonework products by NICOLOCK, TECHO-BLOC, and BELGUARD to replace worn asphalt driveways and concrete pads. Our goal is to introduce new hardscape solutions that can endure the outdoor elements for years to come. If you are looking to add more outdoor entertaining space, then perhaps a structural solution is exactly what you need. A well designed deck or a deck renovation can fulfill many needs for growing families. There are a myriad of materials available that can be used for your deck project; pressure treated woods, wood composites, or vinyl alternatives. Whatever design you choose or materials you prefer, we will be sure to recommend options that you can count on, so that your project is built to last. Additionally it is beneficial to consider how your property may benefit from incorporating a pergola or shade sails. These overhead structures will allow you to expand the use of your outside spaces by shading you from the sun and the heat on the hottest summer days. Nothing creates more ambiance in your outdoor space than the addition of a water feature. This sensory element can incorporate tranquil sound and unique plantings to your yard’s design. We offer ponds, decorative fountains and waterfalls. Create an outdoor oasis at home and let us craft a water feature that is unique to you and fits your budget and commitment level.